So Forest earn a vital victory as QPR miss the opportunity to go top of the Championship after an eventful second-half at Loftus Road. In the meantime, there's a busy afternoon of football ahead - follow it all with our live text service, where you can also watch Final Score and listen to BBC Radio 5 live's coverage. QPR manager Chris Ramsey told Sky Sports: "It was a penalty and obviously a sending off. No complaints. It wasn't the right decision but these things happen. Before that I could only see us winning and scoring another but we went down to 10 men and they did a very professional job on us." "It could not have gone any better, I'm knackered, I gave everything, it means a lot to be here. "It feels strange to hear the fans singing my name." That victory is Forest's first in four matches, while QPR suffer their first Championship loss since the opening day of the season. A big three points for Nottingham Forest, who earn their first win at Loftus Road since 1998. There will be six minutes of injury time. Can QPR find a leveller? "Is there a fire-drill?" 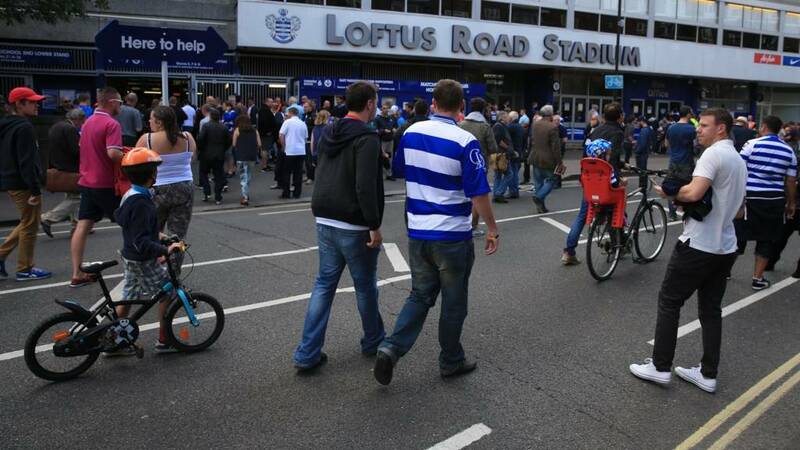 chant the Nottingham Forest fans, as QPR's supporters begin to spill out of Loftus Road. Have they given up hope? There will be six minutes of added time. Chris O'Grady has put in one heck of a shift up front on his own for Nottingham Forest. He looks like a fine signing for Dougie Freedman. Ben Gladwin comes on in place of Daniel Tozser for QPR with just under five minutes left at Loftus Road. It's all Nottingham Forest now and Nelson Oliveira forces a decent save from Alex Smithies, with his curling strike bouncing awkwardly in front of the Rangers keeper. It's a dream debut for Nelson Oliveira who gives Forest the lead with a low strike from the edge of the area. Alex Smithies will feel he should have kept the effort out, though. More indecision in the QPR defence and Chris O'Grady hooks a ball over Alex Smithies but it lacks power. What an unexpected lifeline that was for Forest, plenty for QPR boss Chris Ramsey to ponder with just over 12 minutes left and his side down to 10 men. Henri Lansbury converts from the penalty spot and Nottingham Forest are level. Alex Smithies is brought on in the QPR goal with Massimo Luongomaking way. His first job will be to face the penalty. Rob Green is sent off for bringing down Chris O'Grady. Green tried to control a backpass, but failed to do so, and brought down O'Grady as the striker pressured him. QPR down to 10 men. It's never a great feeling when a substitute is substituted but that's exactly what's happened to Kyle Ebecilio. He's been replaced by Nelson Oliveira as Forest look to get back in this game. Charlie Austin breaks the deadlock, but should Dorus De Vries have done better? Austin's strike from the edge of the box is low and powerful but it spills into the net under the dive of the Forest keeper. Chris O'Grady superbly holds the ball up for Forest, as he has done all match, and feeds Kyle Ebecilio but his curled effort is high and wide. QPR defender Nedum Onuoha meets a corner on the volley but his effort from six yards is the wrong side of Dorus De Vries' post. Charlie Austin finally finds space in the Forest box but just as he looks to pull the trigger he loses his footing and the visitors clear the danger. Rangers' James Perch has a free header at the back post but he gets it horribly wrong and it's well wide. Ryan Mendes is down with a knee injury after a challenge, he's certainly putting himself about on his Forest debut. Henri Lansbury bursts forward for Nottingham Forest and unleashes a strike from 25 yards, which deflects off Nedum Onuoha and flies just wide of Rob Green's goal. Forest midfielder Michael Mancienne looks as if he has tweaked his hamstring and his game is over. Kyle Ebecilio is brought on in his place. This is better from QPR with Massimo Luongo and Tjaronn Chery finding pockets of space. The game looks as if it's opening up. At the other end Tjaronn Chery's curled strike from 20 yards is well held by Forest keeper Dorus De Vries. Better start to this half. Forest winger Ryan Mendes wins a free-kick on the corner of the box and Henri Lansbury tests Rob Green at his near post with a low strike, but the Rangers keeper is behind the shot. Jamie Ward is brought into proceedings by Nottingham Forest, with youngster Tyler Walker making way. The game is back under way. The teams are back out on the pitch at Loftus Road. Can either of them break the deadlock? Brighton and Hull, the Championship's top two at the start of play today, meet at the Amex Stadium. Before kick-off, both sides will pay tribute to the victims of last month's Shoreham air disaster. Derby will hope to achieve their first league win of the season when they take on Preston. Record signing Bradley Johnson is expected to make his debut for the Rams. Tomorrow from 11:45 BST, we've got live text commentary of the weekend's final Championship game - Fulham v Blackburn Rovers. Reading showed no signs of rustiness last night as the Championship returned after a two-week international break. Portuguese striker Orlando Sa scored a hat-trick as the Royals thrashed Ipswich Town 5-1 for their first home win since March. Ipswich manager Mick McCarthy described the defeat as "sobering" as his side missed the chance to go top of the table. So, not much to report from the first half in this match - the first of 10 Championship games being played today. And it's half-time at Loftus Road. Forest have a corner on the stroke of half-time but Matt Mills scuffs a side-foot from close range and it trickles towards Rob Green harmlessly. James Perch bursts forward for QPR but he wastes the chance to send in a decent ball with a poor cross and the chance is gone. QPR winger Matt Phillips sends in a dangerous inswinging cross but Massimo Luongo's header at the far post lacks power and keeper Dorus De Vries is equal to it. Right, we've got five minutes until half-time and it cannot come soon enough. Very little in the way of action at Loftus Road. Nottingham Forest's David Vaughan tries his luck from 25 yards but it doesn't trouble Rob Green. At the other end centre-half Matt Mills receives a boot to the face. It's that sort of game. We're still waiting for our first goal in the Championship, but the deadlock has been broken in the Premier League. Steven Naismith has scored twice to give Everton a 2-0 lead against champions Chelsea at Goodison Park. No wonder Roberto Martinez looks so pleased. Click here for coverage of that match and the rest of today's Premier League action. Few groans of frustration around Loftus Road but plenty of encouragement also. The hosts are struggling to get a hold of this game against a very organised Nottingham Forest outfit. Gabriele Angella is continuing to feel the effects of that earlier clash and he is off the pitch again. It brings an end to his QPR debut and Grant Hall is brought into proceedings. Nottingham Forest are pressing here and Ryan Mendes again shows quick feet before dragging a shot from 20 yards wide of Green's goal. Antonio left Forest for a reported fee of about £7m. Chris O'Grady continues to prove a nuisance up front for Nottingham Forest, and after brilliant hold-up play he feeds Eric Lichaj, but the full-back's strike from 12 yards is straight at the legs of Rob Green. Matt Phillips does well on the Rangers right and feeds Daniel Tozser on the edge of the box but his strike is well blocked. Nottingham Forest have their best spell of the game, keeping the ball, dominating possession but they attempt to split the QPR defence and Chris O'Grady is caught offside. Disappointing. QPR's James Perch is booked for a cynical scythe on the fleet-footed Ryan Mendes. QPR have their second corner of the game but Michael Mancienne heads it clear for a throw-in and the chance is gone. Nottingham Forest are taking the sting out of the game and Chris O'Grady, who is a big old unit, is putting himself about up front. You have to go all the way back to 28 February to find Forest's last away win - a 3-0 victory at Reading. Few alarms for them so far in the opening 15 minutes at Loftus Road. Still waiting for things to settle down here at Loftus Road and we are still awaiting our first attempt on target. Charlie Austin the latest QPR player to try his luck from range but it's well wide. Angella, now sporting a blue head bandage, rejoins proceedings and we're back up to 11 v 11. QPR debutant Gabriele Angella is claiming foul play after receiving a stray elbow to the face. He's covered in claret and goes off for treatment. Matt Phillips flashes a shot wide for QPR in what has been a scrappy start to the game. Debutant Ryan Mendes looks lively for Nottingham Forest, who seem to be playing 4-2-3-1 with Chris O'Grady up top. QPR forcing the game and they have an early corner which is cleared comfortably. We are under way at Loftus Road as the hosts get the ball rolling. Reading pair Orlando Sa and Nick Blackman, who both found the net for the Royals last night, also have four league goals this season. Former Burnley striker Austin scored three times in the first two league games that QPR played at Loftus Road this term. QPR boss Chris Ramsey did not expect to still have Charlie Austin in his arsenal this weekend and believes the striker will now be a man on a mission after top-flight clubs failed to take the chance to sign him. "Hand on heart, I didn't see us preparing for this game with Charlie in the squad," said Ramsey. "But he's still here and he probably feels as though he's got a point to prove now - and he really wants to do well for QPR." Remember you can listen to coverage on BBC London 94.9 or BBC Radio Nottingham if you're lucky enough to live in either of those locales. Unfortunately, a rights issue prevents us from streaming Football League commentaries on the BBC Sport website. QPR are unbeaten in seven home games against Forest (W4 D3), last tasting defeat in January 1998. Can they keep that run going? Subs: Evtimov, Ebecilio, Oliveira, Ward, Blackstock, Hobbs, Burke. Nottingham Forest hand debuts to Chris O'Grady and Ryan Mendes, while Nelson Oliveira is on the bench. He is joined there by forward Jamie Ward, who returns from a hamstring injury, but there is still no Andy Reid. Subs: Smithies, Hall, Hill, Gladwin, Doughty, Hoilett, Emmanuel-Thomas. QPR give debuts to defender Gabriele Angella and midfielder Daniel Tozser. Karl Henry also returns to the starting line-up, with Grant Hall, Alejandro Faurlin and Michael Doughty making way. Faurlin suffered a slight knock in training yesterday and is not being risked. After what seems like an eternity, the Championship is back and Loftus Road is the stage for Saturday's lunchtime kick-off. Nottingham Forest are the visitors to west London, where they face an in-form QPR. Team news, pre-match thoughts and the odd statistic coming your way very shortly. Thanks for joining us.